After reaching more than 350,000 users on iPhone and Android, “News Republic” extends its reach on Smartphones and launches its Honeycomb edition for Android tablets. Thanks to its TagNav© news tracking system, which learns your particular news preferences and displays the stories most relevant and of interest to you first, News Republic is now the top-rated news app in the Android Market. 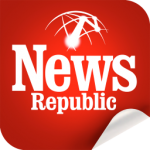 News Republic, the best-rated news app on Android worldwide, is now available across all major Smartphone platforms including Blackberry, Nokia OVI, Samsung Bada. The WP7 edition will also be available soon. News Republic has taken its “open news for the end user” approach to the Android tablets, bringing together content from various high quality sources and pairing it with its renowned TagNav© system—allowing users to hop from topic-to-topic and source-to-source and read the news all from the same screen. Ultimately, the app provides a perfect world of news that lets readers view all sides of a story from a variety of sources. And now, News Republic’s new fully-customized version features a slick user interface especially designed for Android Honeycomb tablets and a stunning photo gallery of top stories. “In a world of information overload people want to receive timely and accurate information on subjects that specifically interests them. News Republic does all of that and addresses the natural need for users to have full and complete access to information on the subjects they really like, instantly,” says Gilles Raymond, CEO of Mobiles Republic. With the TagNav© system, readers can delve deeper into the stories that are most important to them by selecting highlighted keywords (Google, Cannes Film Festival, or even Lindsay Lohan) to pull up a slew of targeted articles related to that topic. Over time, News Republic is able to “learn” users’ preferences on topics and sources, so that instead of having to dig around to find what interested him, the app can display those stories for them. News Republic’s global approach paired with local content lets users get the news pertinent to them from top sources like the Associated Press, Reuters, WENN, Tech Radar, and more—all from a single app. Its aim is to be the premiere news app for smart and savvy readers who wish to stay informed of the breaking headlines in both international news and local news. Fresh, global and local content: updates from the most respected newswires worldwide providing thousands of daily top stories in US News, International, Business, Sports, Technology, Entertainment, and more. Your personalized news channel: endless customization options with your myNews channel as you pick the topics, people, or events that you want to read about. Surf the news: the TagNav© system allows you to explore specific topics related to news stories you’ve read and add them to your own myNews channel. News Encyclopedia: whatever the topic, you also have the option to go deeper and search and discover more. With over 120,000 topics covered, you can search and reference related articles and themes across the entire web to discover more on any topic you choose in an instant. Users use it twice more than any other News app available and are 80% more accurate (source: Flurry analytics). They also don’t hesitate to recommend it since it is currently listed as the News application with the highest rated on the international Android Market worldwide (average 4.6/5) and App Store in Europe (average 4.3/5). News Republic is free and available worldwide. The iOS version is available on the iTunes App Store. The Android version is available on the Market, as well as independent stores (GetJar, Appbrain, Androlib, etc.) in the News section.